Sativa dominant African strain with an energizing, euphoric high. Durban Poison is a Sativa dominant strain that originated from Durban, South Africa. Hugely popular with both indoor and outdoor growers, it requires moderate care and attention to achieve it’s biggest harvests and maximum quality. Originally a natural Land-race strain, all our recommended Durban Poison seeds are completely feminized, ensuring that each seed you germinate will produce a strong, vibrant female plant, capable of producing large, dense buds and high quality harvests. It’s dominant 60% Sativa genetics produce a tall, bushy plant with a 10 week flowering cycle. Although Durban Poison cannabis seeds can be grown outdoors, the short Summer season and fast onset of winter often reduces the available flowering time, and so indoor grown plants are often bigger, of better quality, and yield substantially more. Outdoor growers should expect approximately 350 grams of dried buds per plant, while indoor growers, especially those using super-cropping techniques such as pruning, staking, topping or bending, should enjoy far bigger harvests, around 550 grams per square meter, as well as improved quality and flavor. Durban Poison cannabis is well known for its energizing, euphoric high, and although relaxing, it can spark creative thoughts and stimulate the imagination, a perfect strain for enjoying during the day, or with friends when socializing. THC levels of approximately 20% ensure that all but the most seasoned users enjoy a long-lasting, fast-acting high, while the CBD content of 0.24% provides some natural pain relief, as well as reducing stress and tension. We highly recommended these feminized Durban Poison cannabis seeds for those growers looking for cannabis with an energizing, euphoric high. Enjoy large buds and heavy harvests with very little attention or experience required. Just reduce the light hours to 12 hours on and off per day, and let these babies flower. You can buy Durban Poison feminized cannabis seeds in packets of 5, 10 and 25 with all seeds hand selected to ensure perfect ripeness. 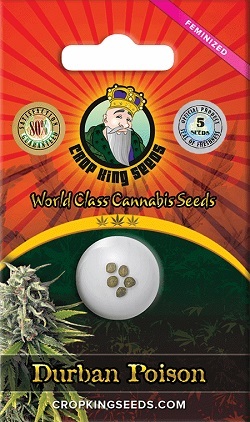 Shipped directly from Crop King, Canada’s leading online cannabis and marijuana seed supplier, enjoy a variety of payment and shipping options, as well as the highest quality customer care, to answer any worries or concerns. Click below to learn more about Durban Poison feminized cannabis seeds..
Buy Durban Poison Feminized Seeds today and receive fast discreet shipping to Canada and all US states.